The Concrete Centre is part of the Mineral Products Association, the trade association for the aggregates, asphalt, cement, concrete, dimension stone, lime, mortar and silica sand industries. For two months, artists Max Coulon and Gabriel Khokha threw paint at the pristine concrete surfaces of the newly completed Henri Dutilleux Conservatoire of Music, Dance and Dramatic Arts in Belfort, north-east France. This was no act of vandalism. Instead it is an entirely deliberate marbled effect conceived to enhance the monolithic form of the 3,895m2 building. The conservatoire contains 36 classrooms as well as rehearsal rooms, drama studios, a library, amphitheatre and auditorium. Architect Dominique Coulon & Associés had the idea for a surface embellishment to the concrete structure quite late in the design process. “The building backs onto woodland, and we felt it was a good idea to offer a texture that reflected that. The veins can be seen as tree branches or the veins found in natural stone,” says Dominique Coulon, adding that the design was inspired by the paintings of Jackson Pollock. “We were looking for a texture in keeping with the presence of the concrete which would function as a filter.” The architects wanted the building to appear enigmatic. This explains its largely insular form – only the cantilevered dance room offers extensive views in and addresses the town’s monumental Belfort Lion sculpture on the hillside opposite by Statue of Liberty sculptor Frédéric Bartholdi. The artwork accentuates this sense of otherness, covering all surfaces except those “hollowed out” of the building mass. “We wanted to emphasise the singularity of the building,” says Coulon. “This strange texture raises questions. The building takes on an atypical character in relation to its environment.” The artists worked directly onto the concrete structural walls, which were cast in situ using metal formwork panels with lengths of 240cm. It was the first time that they had attempted such a work on a building and, unlike Pollock, they had the added difficulty of working on vertical surfaces and even undersides. They practised the splattered paint effects on derelict industrial buildings and made their own tools in order to achieve the right density of paint. The final work was carried out from a mobile cradle using a light and dark shade of blue, the two lines of paint splatters intertwining to produce a circular movement. In the courtyard at the heart of the building, the walls were given a “negative drip” of white on a black background. According to the architect, this reversal of the treatment adds drama to the space and is the ultimate expression of density. 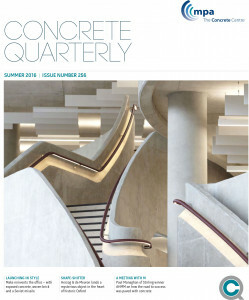 Internally, the concrete walls, floor and staircase of the entrance hall and circulation areas are left unadorned due to their “excellent texture”, says Coulon, with no treatment other than a dust protection system.